Ken, tell us about you. Who are you? What do you do? Do you have other hobbies? 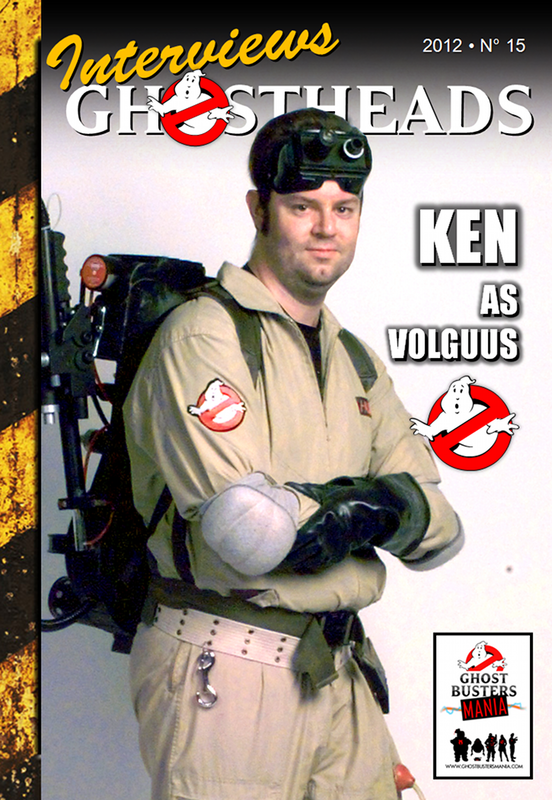 My name is Ken Huegel, known as “Volguus” in the online GB world. I’m 45 years old but I have the body of a 25-year old (hidden in the back of my closet). I’ve always loved science fiction and fantasy, mostly the futuristic or technological kind. Spaceships and lasers, yes. Hobbits and magic students, not so much. Definitely no emo teen vampires. I wonder how many enemies I made just now? LOL. I’m New Jersey born and bred, and I currently live in Bucharest, Romania but my heart is still in Southern California where I lived in between. My day job is art director for my wife’s advertising agency and I also freelance in photography and voice announcing work. My hobby is still making costumes and props, but it’s been somewhat slower and harder to succeed in Romania. In late 1983 as a high-school senior, I was in Manhattan one day, touring a college (NYIT) which I’d hoped to attend the next year. As I left, I heard a huge commotion on the next street (Central Park West). I discovered a disaster scene, with the street torn up into huge chunks, police cars buried in the huge holes, and a noisy crowd. When I got closer I finally noticed the film crew, and signs informed us that if we stayed here, we were agreeing to appear as unpaid extras in a film. So of course I did! 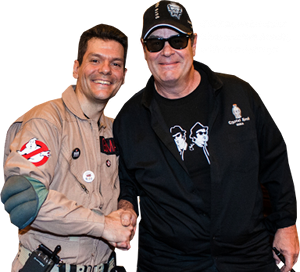 All we did was cheer and shout “Ghostbusters!” “Ghostbusters” a few times, and after many years of scrutinizing the film, I’ve concluded I’m not visible in it, but still – I was connected with the film before it was a film! I wasn’t impressed, however, because I thought it was just going to be a movie version of the silly old Saturday morning show “Ghost Busters” with a man in a gorilla suit. How happy I was to be wrong! You were one of the first to create the costume and proton pack. Tell us about this experience. I’d been making other costumes before then, space aliens, Darth Vader, etc. and I could always make my work look better than it actually was, by focusing my efforts on only the parts that would be visible. Just like a Hollywood set, where the visible part may be a magnificent throne room but the backside is raw wood and nails. I built my first Proton Pack this way in 1984, and the “cyclotron” was the bottom of a plastic wastebasket glued onto a 33RPM record. But it looked great when it was all painted the same color. Even in the late ’90s when I built my first “serious” Pack, nobody was selling pieces or premade sections yet. The Internet really only had one serious GB discussion forum. We fans first became aware of each other at this time and slowly built up a basic Pack reference database this way: One person would say “I found where this part comes from” then another and another. The biggest thrill of the hobby back then was when someone posted a new discovery about a Pack part or measurement. That doesn’t happen so much anymore, I think we know about all there is to know. Oh, I sound just like a grandfather now… “you kids have it so easy today, just order the parts and glue ’em together”. LOL, I know that’s unkind, but my early pack which is considered such a landmark, had a crank knob and power resistors carved from wood and plastic bits, because we hadn’t heard of Dale, EHC, Legris yet! It was because of this need and I was in the right place at the right time (for once), I was among the first to offer pre-made parts to help the Pack building process. Some people tell me, over a decade later, “Volguus” Parts still carry respect and desirability. Which has-been until now your favorite event and why? Of course one thing stands above all others – my greatest joy and my greatest tragedy. In 2004 I spent my life savings to buy a genuine Sony Pictures screen-used Proton Pack. I went to Los Angeles to pick it up, and disassembled it into two suitcases in order to bring it back. One suitcase arrived with me back in Romania, but the other was delayed and stolen before I could retrieve it. So I now only have parts of a Screen-Used Pack, most notably the Bumper, the Alice frame and the metal Ion Arm end. Fortunately, while in LA, Sean Bishop (Venkman71) and I took several photos and exhaustive measurements of the pack before I left, so luckily the disaster was not a total loss. Information gathered from my screen-used pack is still being used today! In a very real way, Ghostheads were an early online social network. We were geeks before it was cool, LOL. (Uhh, it IS cool NOW, right? Right?) We’d all come together to build this definitive GB costume knowledge base, but the real achievement has been this global community of friends who share common interests. With fans now organized into location-based “franchises”, we seem to be evolving just as the 501st Legion has. But my main point is this: most other SF/fantasy costumes highly restrict who can successfully wear them. If I were short and fat, Vader would not be a character I could realistically emulate. But Ghostbusters, underneath their high-tech equipment and supernatural job descriptions, are just normal, everyday guys like the rest of us. Remember, they were originally described as “paranormal trash collectors”, and you don’t need to be Mr. Universe to fill that role! So all ages, shapes, sizes and genders can be Ghostbusters, and nobody risks ridicule. I also like that the term “Ghosthead” has endured; it feels a fitting tribute to the man who coined it, Norm “Paranorman” Gagnon, one of the very first online GB costume resources. I plan to have a new GB costume together in 2012. Of course, I said that in 2011 as well, LOL. I must admit that I’ve enjoyed a lot of recent activity in the 501st Legion, so Darth Vader is eating up all my hobby time these days. Even so, I’ve just (hopefully) made a very significant contribution to the GB costume hobby. Of course I can’t tell any details, but if this thing happens, I’m sure you’ll all know about it right away! Of course! The GB fans that have costumes are only a small percentage of all GB fans, and it is the “rest of you” whose love and encouragement make it such a joy to become these characters. I can’t wait to introduce my GB costume in Romania. I have just been made aware of a large and eager “cosplay” subculture in this country and so my biggest “hello” goes to all the fans I have yet to meet!